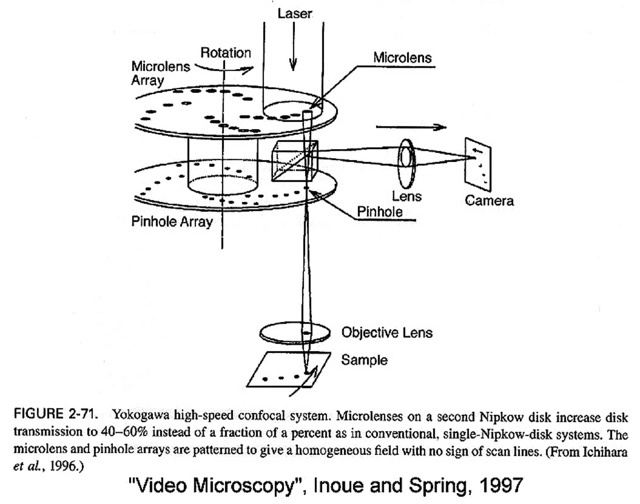 A Nipkow spinning disk microscope is one type of Fluorescence Microscope. A Nipkow disk is a spinning disk with a series of equally distanced circular holes of equal diameter drilled in it. It was invented by Paul Nipkow in 1885. Applied to a Fluorescence Microscope, it allows the sample to be scanned with an array of light points transmitted through these holes, participating in some of the advantages of a Confocal Microscope. Spinning disk microscopes are very good for living samples because they are fast and have relatively low phototoxicity. For fixed samples, a point-scanning Confocal Microscope is, in some cases, a better solution. A Yokogawa Disk is a Nipkow disk with an array of microlenses in (or right after) the holes used in many commercial spinning disk microscopes. Spinning Disk images are very well suited for Huygens deconvolution with the Spinning Disk optical option, specially designed to take into account the optical properties of spinning disk microscopes.